Social Media has become important part of every website.You should add social media button on your site to help visitors share your content.The buttons should be appealing to visitors.It should also be easy to use.Sharethis fulfills this requirement. Sharethis social media buttons pops up window when mouse is moved over the button or the button is clicked.The size of pop up windows are small.On the pop up window you can select the social networking site for sharing the content.Thus user never leaves your page.After sharing visitor can close pop up windows and continue browsing your site. Sharethis help you place social media icons of your choice on to your website with ease.It provides support for wide range of platforms.So without making any code changes you can make your website social.According to Sharethis website itself it provides official plugins for popular content management systems like WordPress,Drupal and Joomla.It provides support for Blogger,TypePad and Tumblr.It also provides support for mobile operating system IOS and Android.So adding Sharethis social sharing buttons is not an issue for you.Simply install these plugins and you are good to go. You can also track Sharethis widget actions in Google Analytics as well.All you need to do is add your Google Analytics ID (the UA string). 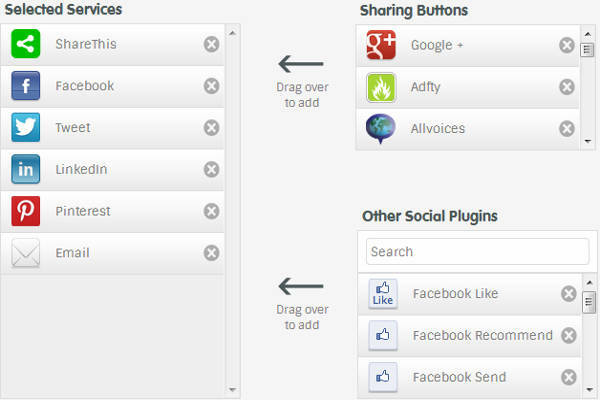 Click on Get Sharing option. Select the Style of your choice.Below image shows the styles offered by Sharethis.The Featured style offers Frictionless Facebook Share feature.You can select style of your choice by clicking on that option. Select the social media platforms you need.You need to drag social media icons to add or remove.All the major social networks are listed. Copy all the code and paste it into a text editor. Open footer.php file of your theme. By making above changes we are loading Sharethis social media buttons after page load.So your website content is loaded first then after page onload your social media buttons are loaded.This decreases page onload time.So visitors are able to see content faster.Social sharing takes place if visitor finds it useful.After scanning the content or reading it visitor decides to share it or not.Thus loading social media buttons after content load is perfectly fine. So you are making your page faster.This is important for visitor experience as well as search ranking.At the same time you are not hampering social sharing ability of your website. Sharethis also provides social media analytics.It provides page wise details as well as social network wise details.It also provides information about Referral traffic generated from social networks for each social action (share,tweet or like).So you can easily monitor social media performance of your individual content. Performance of Facebook share button on my site is better than Facebook like button.This was hard to believe as it is easy to like an article than share it.But my visitors preferred share button more than the like button.So I have decided to dump Like button and use share button.Things like this can only be possible after digging into statistics. You can use the stats to decide which social media you should use.I had good time using StumbleUpon on my website.It works better than Pinterest for my site.Initially I thought Pinterest may be better but I was wrong.I got this information after reviewing social sharing stats of my website and referral traffic generated from them.Insight like this can only be made if you have detailed statistics.Sharethis provides you with the statistics.You need to analyze it and come up with best combination for your website.